It's birthday week in our house and I love to make a fun meal that lights up dinner time. This is what's on the menu for tomorrow. Growing up dinner time was an important time in our home. My mom would always have a hot home cooked meal sitting on the kitchen table, ready for the family to come home and sit down to eat together. Where I grew up we didn't have access to fast food and it wasn't a bad thing!! Life is so busy, and it's a great time to sit down as a family and enjoy a home cooked meal, even if it's a little chaotic. It's making memories that will last a life time. In a medium nonstick skillet, heat the oil over medium heat. Add the ginger and garlic, stirring constantly, until fragrant, about 1 minute. Season the chicken with salt and pepper and add to the skillet. Saute until cooked through, about 5-6 minutes. Transfer the chicken to a plate and set aside. In the same skillet, combine the broccoli florets and the water, stirring to scrape up any browned bits on the bottom of the pan. 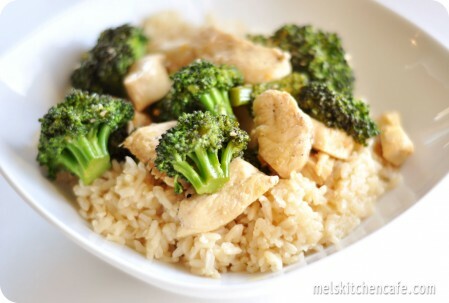 Cover the skillet and cook until the broccoli is crisp-tender, about 2 minutes. Return the chicken to the pan and stir in the broth, orange juice, soy sauce, sugar and orange zest. Add the dissolved cornstarch mixture and cook, stirring frequently, until the sauce boils and thickens slightly. Serve over hot, cooked brown or white rice.